increase the use of computing within existing courses. The primary aim is to teach computing as an additional dimension of the statistics program, and not just to leverage it as a medium by which to teach "traditional" statistical topics. Nor are we focusing on using computing within the introductory statistics class within this project. We believe this combination of topical problem-based data analysis, new methodology and rich computing and visualization is important for statistical education and practice in this era of multi-disciplinary, data-centric scientific collaboration. We also feel that it will help to attract talented students from different sources than we have previously drawn from and to retain existing students who are interested in ensuring that statistics and data analysis have an impact on science and knowledge discovery. It is of course obvious that all statistical analyses are done via a computer, and that technology and computing advances dramatically influence statistical practice. Yet very few programs teach students more than elementary utilitarian computing skills. Sample syllabi for different courses. See also links to courses at Links to existing courses. 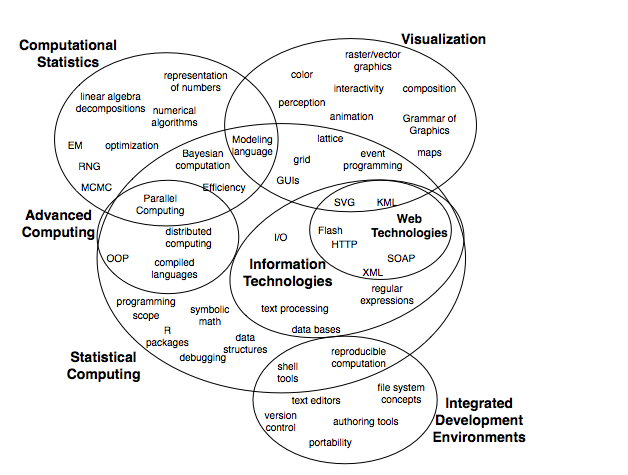 Computing in the Statistics Curricula , under revision for The American Statistician. Comment on Brown and Kass TAS article What is Statistics?, The American Statistician, 2009, 63:117-121. Approaches to Broadening the Statistics Curricula Chapter in Quality research in literacy and science education: International perspectives and gold standards, M. C. Shelley II, L. D. Yore, & B. Hand (Eds. ), Springer, 2008. Text book on Data Technologies for Statistics. This project is supported in part by the National Science Foundation grant DUE 0618865 and DMS DMS 0636667.